Charro Beans! You’ll be hard pressed to find an authentic batch of Charro Beans anywhere north of the border, so it’s high time to make your own! Charro roughly translates as cowboy, so these beans have always been associated with ranch lifestyle in Mexico. Luckily for us, you can make a hearty, delicious batch of these frijoles in your home kitchen in less than a half hour, no ranch required. 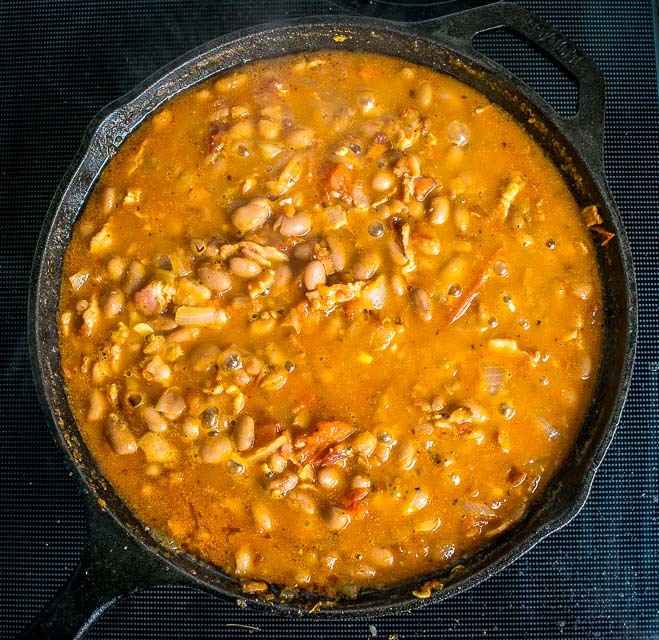 If you’re planning on subsisting solely on charro beans while sleeping outdoors and tending to the ranch, then your frijoles are going to need some substance to them. Traditional batches of charro beans will toss in any meat within arm’s reach of the cook . Our version uses only bacon and this will create a batch that everyone will enjoy. But of course, you are welcome to add in some chorizo or ham if you have some available. Start by roasting four tomatoes in the oven at 400F. 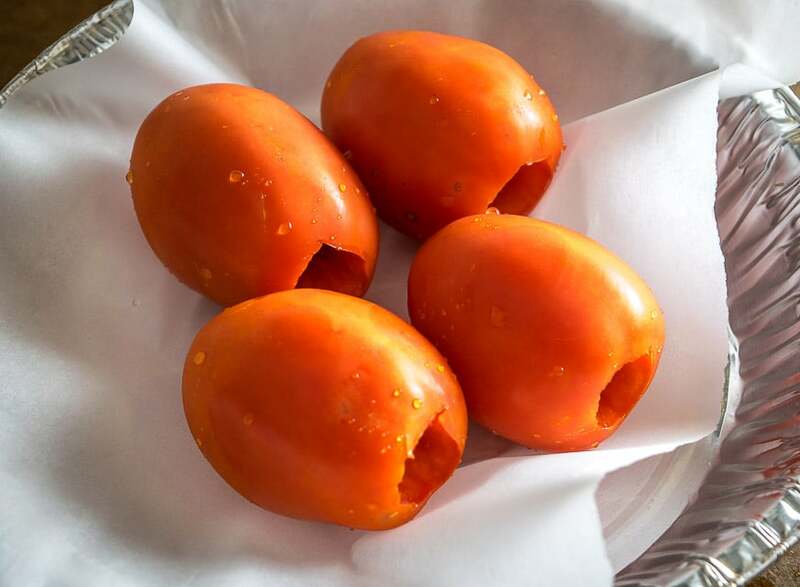 This isn’t crucial for this recipe as there is an extended simmer time coming up that should thoroughly cook the tomatoes, but roasting them has become such a habit that I usually just toss ’em in the oven until they are needed. Finely chop up 1/2 lb. 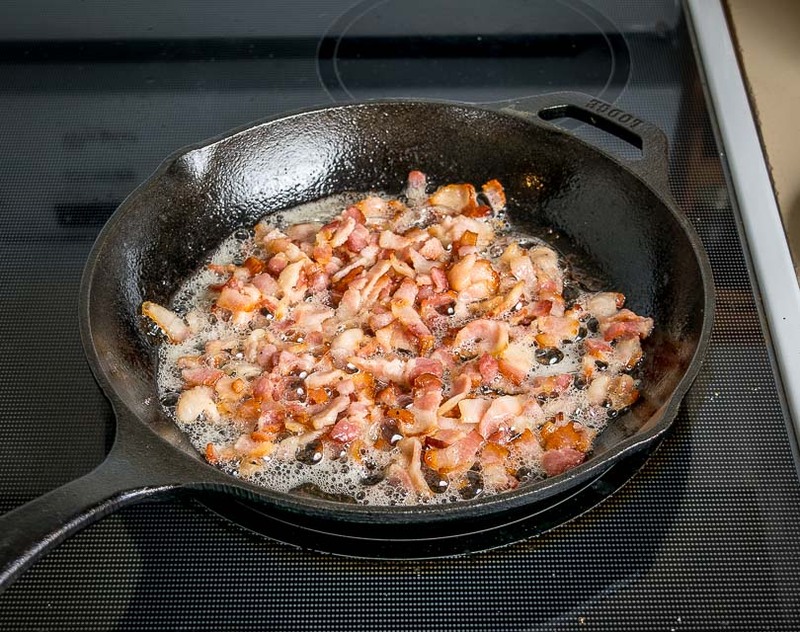 of bacon (7-8 pieces) and cook in a large skillet over medium-high heat. Yes, you can drain some of the bacon fat if you want, but the cowboys prefer that you leave it in. Add a chopped 1/2 onion to the bacon. I usually lower the heat to mediumish after the bacon is cooked. Cook for 3-5 minutes or until the onion is tender. Add 2 cloves of minced garlic to the mixture. The garlic only needs 30-60 seconds to cook; anything longer than that and you risk burning it. Add the roasted tomatoes to the pan. I usually just roughly chop them in the pan. If they’ve been roasting for awhile they will fall apart on their own. The Mexican oregano is optional so don’t sweat it if you don’t have any. And note that this recipe uses canned beans. 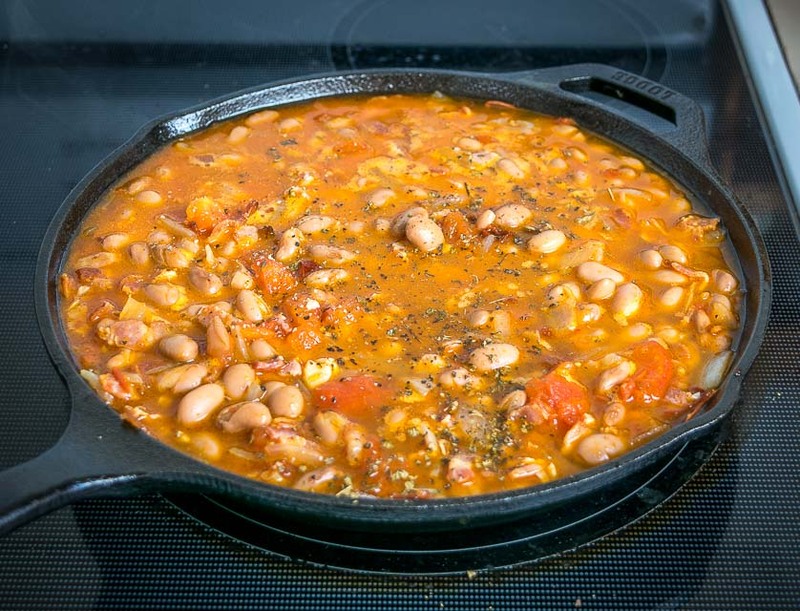 Yes, maybe you’ll get a slight increase in flavor with home-cooked beans, but it will taste just as good with canned beans and I know that most people simply do not have time to cook their own beans. Also…I used chicken stock in this batch to please the cowboys, but I’ve made this exact recipe using water in place of stock and it is still delicious (bacon fat!). And note that using 3 chipotles gives it some real heat! For a milder version use 1-2 chipotles. Let this mixture simmer for 15-20 minutes or until some of the liquid has reduced a bit. The broth is beyond delicious so I think these beans are best served when swimming in it. The above pic is how they looked after 15 minutes of simmering and that amount of broth was a good fit for this batch. Definitely take a taste for seasoning at this point as exact salt amount will depend on how much meat you added to the mixture. I added another generous pinch to this batch so that is approximately one teaspoon total. If your version isn’t fiery enough you can always amp it up at this point too. Serve immediately and be sure to include lots of broth! 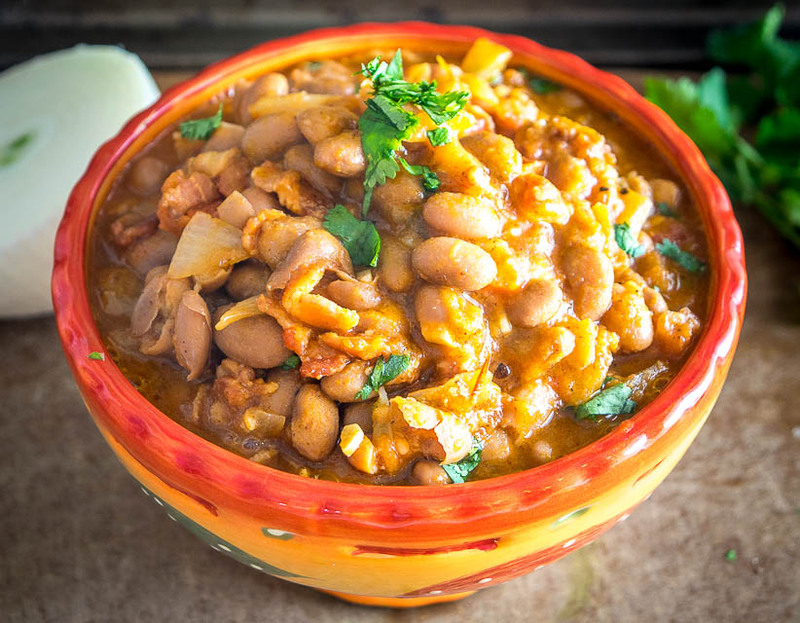 While traditionally served as a side dish, these charro beans are nearly hearty enough to be a meal on their own and I make on-the-fly meals with them all the time. I usually reserve half of the batch to make a bean puree for some bean-n-cheese tostadas. Add the charro beans and some broth to a blender or food processor and give it a whirl. This creates one of the most heavenly bean purees that you’ll ever taste. For realz. 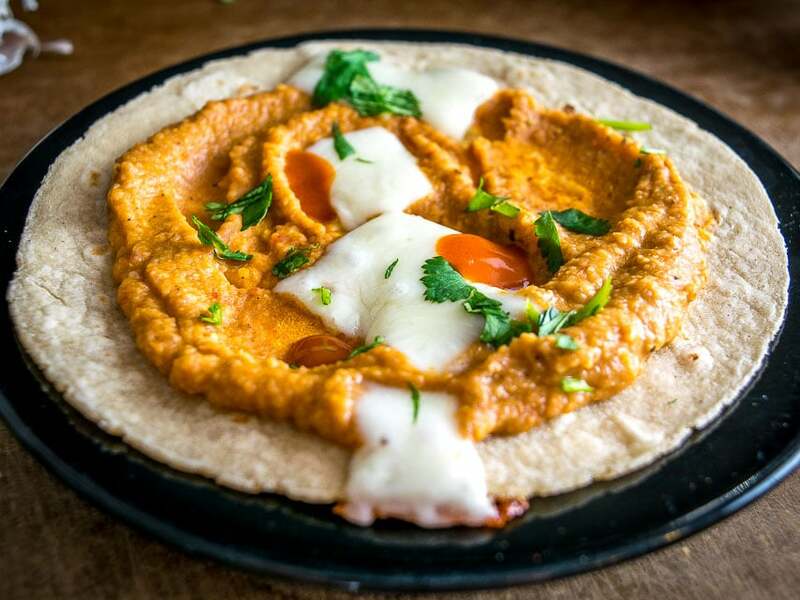 You can use this puree as you would any other refried beans. I usually add a layer to a corn tortilla along with some cheese and crisp it up in a skillet over medium-high heat. Add a few drops of Valentina and you’ve got insta-meals for the next few days. Either way, your cowboys are going to be very happy when you serve up a batch of these Charro Beans. 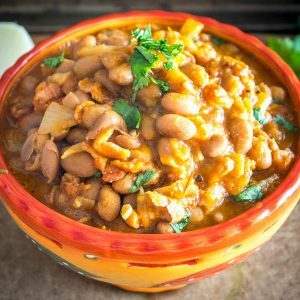 They’re a real treat and if you keep a few cans of pinto beans in the pantry you’ll always have the option of whipping up a batch. Let me know if you have any questions about these beauties. They are surprisingly easy to make and you get great reward for such little effort. Charro Beans! You won't find a heartier, more delicious batch of beans anywhere in Mexico. This version uses bacon and chipotles but feel free to add in some chorizo if you have it. So good! Give the tomatoes a good rinse and roast them in the oven at 400F for approximately 20 minutes or until you need them. Chop up the bacon into small pieces. 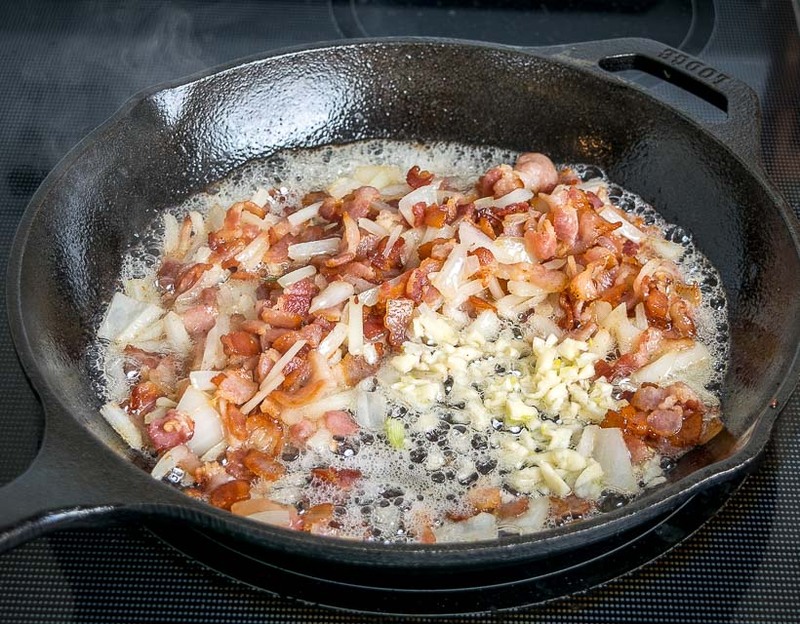 Cook the bacon in a large skillet over medium-high heat until lightly browned (approx. 5-8 minutes depending on the size of the bacon pieces). 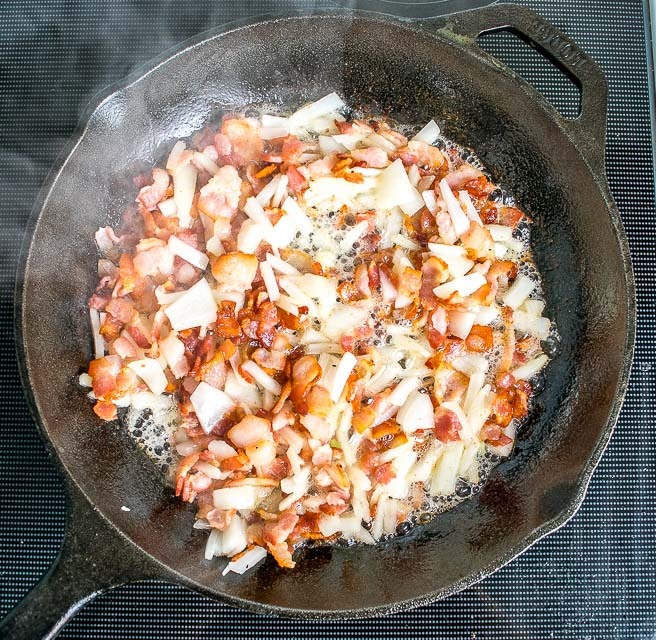 Chop up a 1/2 onion and add it the bacon. I usually reduce heat to mediumish after the bacon is cooked. Let the onion cook for 3-5 minutes or until tender. Add 2 minced cloves of garlic and cook briefly, 30-60 seconds. 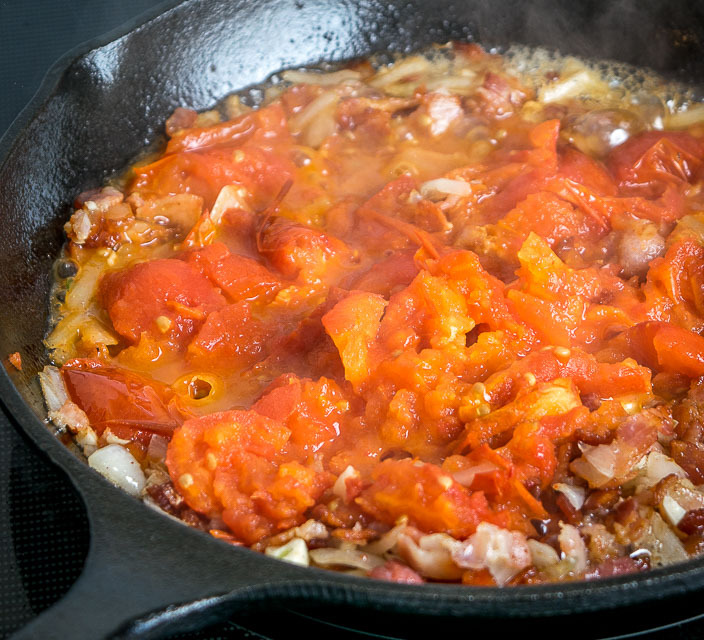 Add the roasted tomatoes to the pan (roughly chopping them up in the pan is fine). Also add: 2 cans pinto beans (drained and rinsed), 3 minced chipotles in adobo, 1/2 teaspoon Mexican oregano (optional), 1/2 teaspoon salt, freshly cracked black pepper, and 2 cups of stock (or water). Combine well and let simmer for 15-20 minutes or until the liquid has reduced down a bit. Salt to taste. I added another generous pinch to this batch (so that is approx. 1 teaspoon total) but keep in mind that if you are using store-bought stock that's high in sodium then you won't need to add as much salt. You can also add more heat at this point if you want a more fiery batch. Serve immediately. Note that these beans are best served in some of the broth. 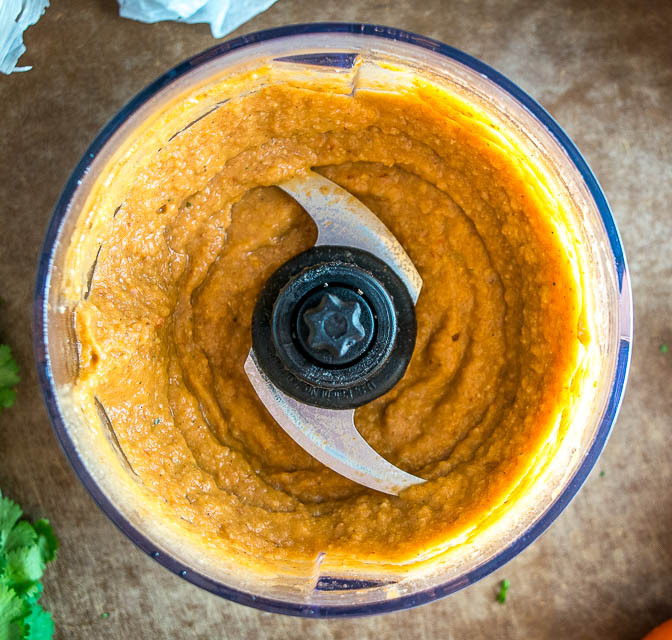 Alternatively, you can use part of the batch to make a bean puree. Simply add them to a blender or food processor and combine into a puree. Although not required, it can be easier to chop up the bacon if you put it in the freezer for 20-30 minutes. Although using stock for the liquid will enhance the dish, I've used water with this recipe before and it still tastes great. If you are using store-bought stock that's high in sodium you won't need to add as much salt as I did. Using 3 chipotles creates some real heat! For a milder version use only 1-2 chipotles. Also note that in a pinch you can substitute fresh jalapenos for the chipotles. I typically use half of the batch to make a bean puree. 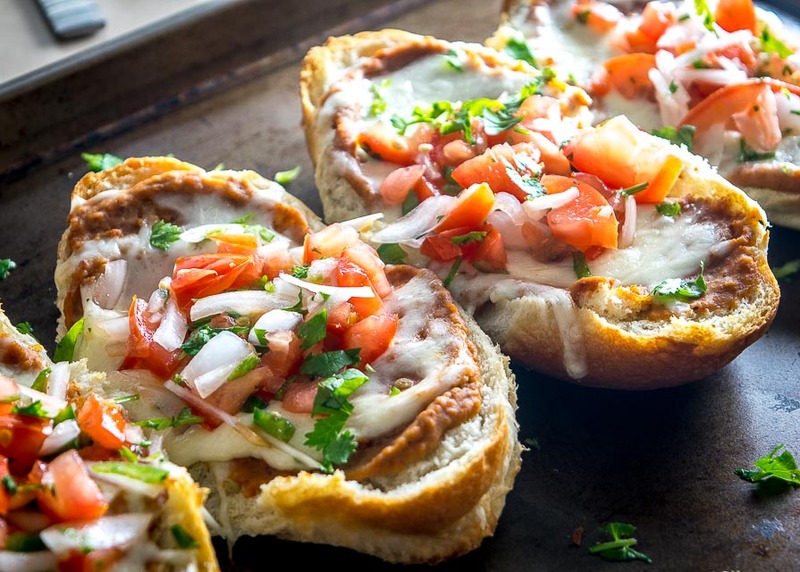 We recently made a batch of Molletes using these Charro Beans. 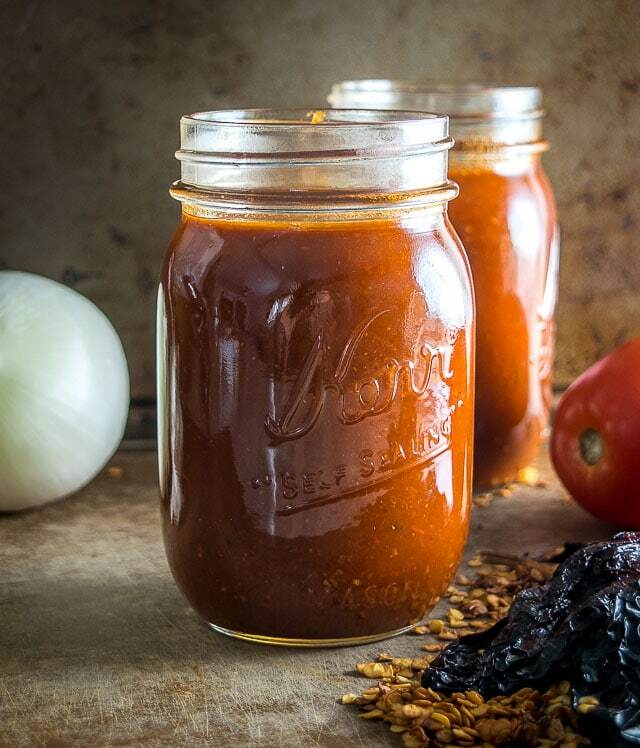 Our latest recipe is for a batch of Homemade Enchilada Sauce. Making homemade pinto beans is so easy. So simple in a crockpot. No reason to use salty canned beans. Thanks for your note Susan! Can you use the bean liquid of the cans instead of water/stock? It wouldn’t taste as good! To be honest I’m not a fan of using that bean liquid Mary as it can be a sodium bomb. I drain and rinse canned beans before using them and usually recommend that for these recipes. Cheers. This was delicious. Major taste with so little work. Used shallots because I had them, 1 can of diced tomatoes instead of whole. I though 8 slices of bacon would be overkill, but it was not. Hey George! I think you said it best — major taste with so little work. It’s such a great combo and I’m always surprised how much flavor it has! Glad you found a keeper recipe. Cheers. When and if you ever published a hardcover book, I’ll be buying two copies out of the gate. I know, I’m with you on that one. Cooking beans should be part of everyone’s kitchen routine but sometimes it can be so hard to find the time for it. Maybe there is potential for a business that keeps people’s kitchens stocked and prepped for Mexican delights??!!! Ha thanks much Kevin, good to know! It’s on my to-do list, but lately my to-do list keeps getting longer instead of shorter doh! HI. There is 1150 mg of sodium in 1/2 tsp of salt. So, leave out the 1/2 tsp. of salt and add the liquid in the canned beans as there is a lot of flavor there. Two cans of beans is about 1360 (680 per can Progresso kidney beans) of sodium if you add the liquid from the beans. Kidney beans are all I had on hand. They have 2% fat but pintos are 4% fat. Carbs and fiber are about the same. Of course, you may not eat a whole can at one sitting. Then there is the sodium and fat from the bacon and ham that are added. I know from experience that beans need a lot of salt or the flavor will not be enhanced. I usually have chorizo around, Mexican and Spanish. Both would be good in this recipe. I think onion, maybe some celery are great but we (a Mexican family) never use garlic in our food and get raves anyway. I would use, however, some cumin. BTW, Mexican oregano is extremely strong and pungent so use a little at a time to taste. I use regular Greek oregano. If you don’t have chipotles, just use a couple of tablespoons of ground chile, mild or hot or both I use Kashmiri Mirch for heat in my recipes. It imparts a bit of heat and sweetness. If you want more sweet, add a little agave. Remember though, sweet cancels out heat. Sorry to write a novel, just some thoughts. Great recipe! Wow thanks much for the details on your kitchen setup — very helpful for peeps! Cheers. For a nice variation, use only 1-2 tomato and add 1/2 cup enchilada sauce. Now that’s great flavor and color. Wow!! I used chorizo instead of bacon (as I had it) and Penzy smoked paprika as I’m not a fan of chipotle. What a great recipe. It was a big hit at my house. Thank you so much for your simplistic recipes and making them easy to do. Great, thanks much for your note Susan. Would love to try this recipe using all chorizo and will probably do so now based on your trip report. Cheers! How much smoked paprika did you use? OMG!!! These were the best Charro Beans! My whole family loved them. I had to make a 2nd batch the next day! Thanks Donna! So glad they were a hit with the fam. Cheers. Wow! I made a double batch of the Charro Beans as part of a taco bar for my Lions Club dinner last night, and they were a huge hit. I’ve been asked to post a link to the recipe in our next newsletter. My only changes were a longer simmer time and to use half the amount of chipotles since some of our members can’t handle the heat. An assortment of hot sauces were near by for those who wanted to up the heat factor. I’m definitely going to be making these again. Thanks much for the feedback Peggy! I’m so glad they worked out for your gathering. Cheers. Can you make this ahead of time and reheat? Yeah I do that all the time Kelly. I store leftovers in the fridge but keep in mind that beans in general don’t keep too well, so you’ll get 3-4 more days out of them after cooking, but probably not much longer. Yum! So easy and flavorful. Thanks for your thoughtful website. Hey thanks Resa, so glad you have discovered these beans! If I wanted to use dry beans for this, how much should I be adding? (I wanted to try this in my new pressure cooker). Also, I couldn’t find any nice roma tomatoes today. Could you tell me the weight equivalent for the tomatoes? Hey Sonya! You’ll get about 3 cups of cooked beans from a single cup of dried beans. This Charro recipe uses approx. 4 cups of cooked beans so you can start with somewhere around 1 1/3 cups of dried beans. And a typical Roma tomato will weigh approx. 3 ounces so 12 ounces of tomatoes is a good starting point for this recipe if you’re using canned tomatoes. Awesome, thanks! that’s about what I ended up adding beans wise. For the tomatoes, I actually meant equivalent different tomatoes, ie, I bought cherry tomatoes instead. Didn’t matter in the end. I had to run out again to get the peppers in adobo so I found nicer roma tomatoes at the store by me. The cherries will have to be used for something else. BTW, this came out amazing. Made it with chips and your pico sauce on this site and it was a very nice meal. I was hoping this would replicate the recipe from an authentic restaurant near where I used to live, and this came pretty darned close. I think a creamer tasting bean would be spot on, so I’ll have to keep an eye out for those canary beans! Ahh okay glad it turned out in the end. I’m a huge fan of those canary/peruano beans so definitely give ’em a try at some point when you track some down, it’s too bad they aren’t more common in the States. Cheers. Just found your website after a girlfriend returned from Mexico saying “I ate charro beans for the first time and they are amazing and you have to find a recipe and make them!” Well….. I made them and today I made the shredded chicken and I must say that it appears you have changed my Mexican cooking life ! Love your writing and easy to follow recipes – thank you, thank you !! 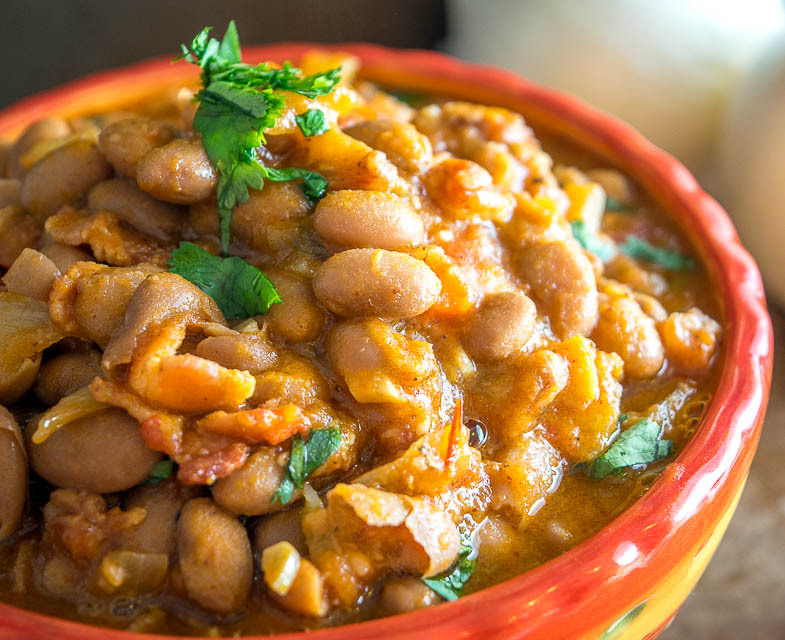 Thanks Dawn — so glad you found this Charro Beans recipe! It’s easily one of my favorites on the site and I love having some blended up and waiting in the fridge for some quick meals. Cheers. Delicious. I’ve made this recipe 4+ times. I double the recipe and freeze half so it won’t go to waste and so the next taco night these are easy to just defrost, heat and eat. I’ve even followed the recommendation to purée the beans for a tostada and I find it very satisfying for a snack or small meal. Everyone who tries these charro beans loves them.